by Markus, Hazel Rose; Moya, Paula M.L. 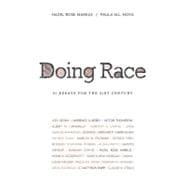 In Doing Race , scholars from across the disciplines have written original essays on race and ethnicity aimed at an undergraduate audience. The book provides a practical response to the view, common in American debates, that race and ethnicity no longer matter, or that race and ethnicity should not be taken into account when deciding how to structure society and formulate public policy. It also answers the question of why race and ethnicity play such a large role in fueling violence around the globe. Doing Race shows that race and ethnicity matter because they are important resources in answering the fundamental, even universal 'œWho am I? '� and 'œWho are we? '� questions. It demonstrates how understanding how identities are shaped by race and ethnicity is central to understanding individual and collective behavior in the United States and throughout the world. Drawing on the latest science and scholarship, these original essays provide undergraduates with an effective framework for understanding the persistence of racial inequalities and problems in the 21st century.